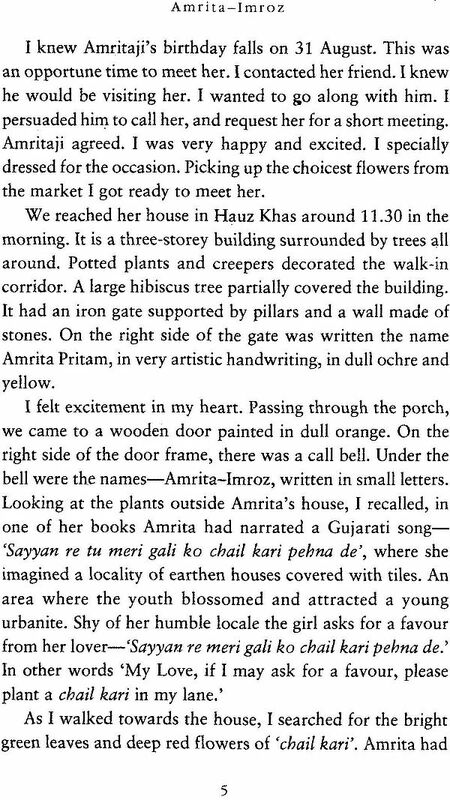 Dr. Uma Trilok's original book-Amrita-Imroz: A Love Story-Begins as an expression of the author's love and regard for Amrita but further deals with Amrita and Imroz's relationship, society's strong reaction against it, the demands of the family, the price asked and the profound impact it had on Amrita's creativity. 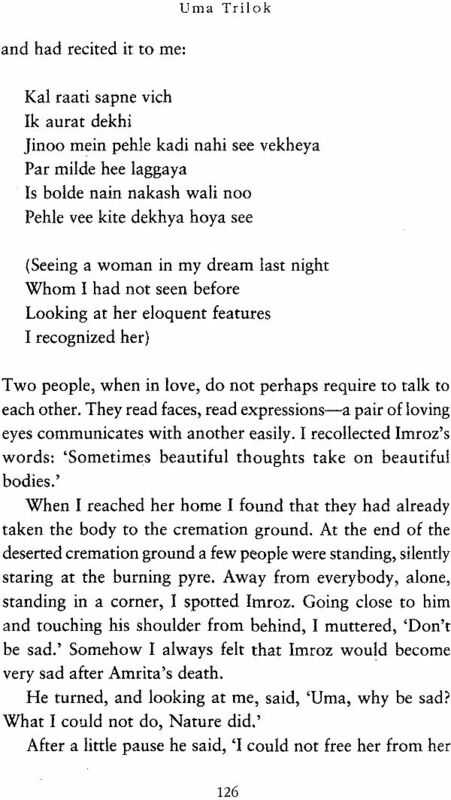 Uma Trilok has not only recognized and understood deeply Amrita and Imroz's relationship but has also tried to present to the reader, a genuine picture of the various intricate facets of their lives, many a time using their own words. From the time of Heer, from the time of the Vedas and Upanishads, from the time of Gargi to today, many women have desired to live their lives on their own terms and those who dared were either defeated or perished. The end was painful. We only know of Gargi's name, none of her creations have reached us. And Heer-she had to take poison. Today's woman dreams that she be not expected only to play the role assigned to her but be left alone to live her own life in her own way. But her bitter circumstantial compulsions and the lack of courage and spirit forbids her from doing so. Her dreams remain dreams. Though she seeks her fulfilment in the lives of people such as Amrita and Imroz. Rooted in tradition, Amrita herself sometimes was perplexed by the revolt she committed and started finding reasons and explanations in her palm lines, her zodiac sign or her previous life connections. About sixty-sixty-five years ago, during Amrita-Imroz's youth, such live-in relationships invited strong social reactions But, today's women like Uma Trilok can openly appreciate Amrita-Imroz's non-conformist relationship without facing the displeasure of their own families. So far, whatever has been written about Amrita, her life style, her writing style, her creativity, her qualifications, the subject matter of her writing and the value system behind it, only a very slight mention of Imroz has been made. What he thinks of this relationship and how much he values it, has not been touched upon. 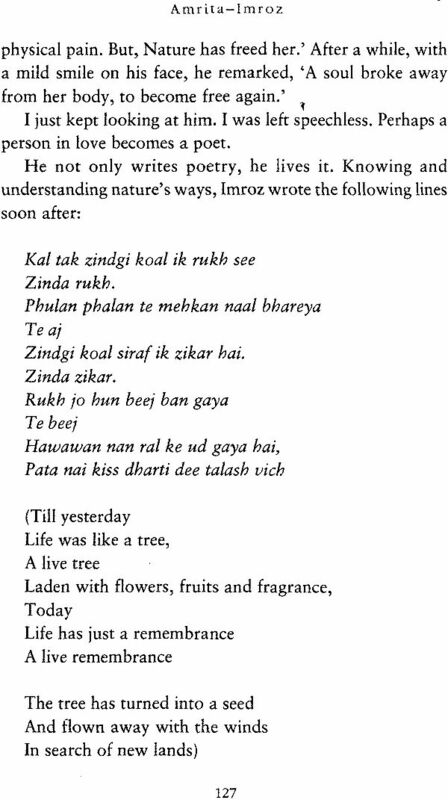 Uma Trilok, in her book, has taken Imroz along in Amrita's literary journey and has tried to assess how Imroz lived out this relationship with total commitment. 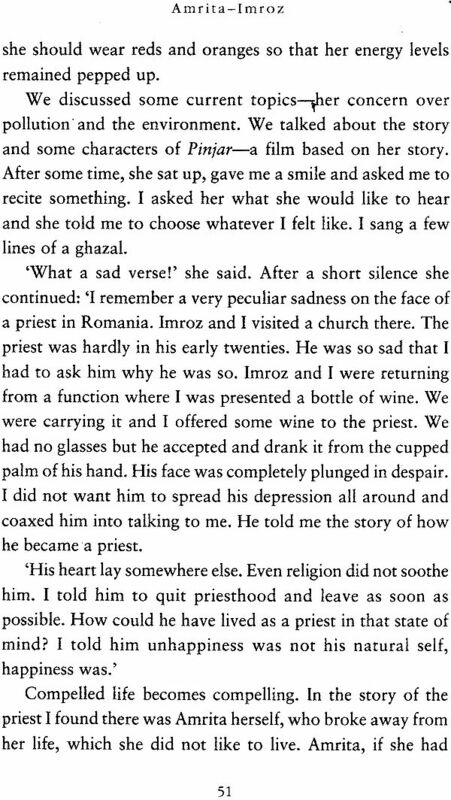 People may say whatever they like but Imroz is not repentant over his decision. Whatever he may have lost or gained, he has no regrets. To resign to the will of his beloved is his joy and not his compulsion. Somewhere inside, he has risen from the materialistic to the spiritual - real and true - from ishke majazi to ishke haqeeqee, which Uma Trilok has captured during her various conversations with him. Since this book is originally in English, it will reach a broader circle of readers. 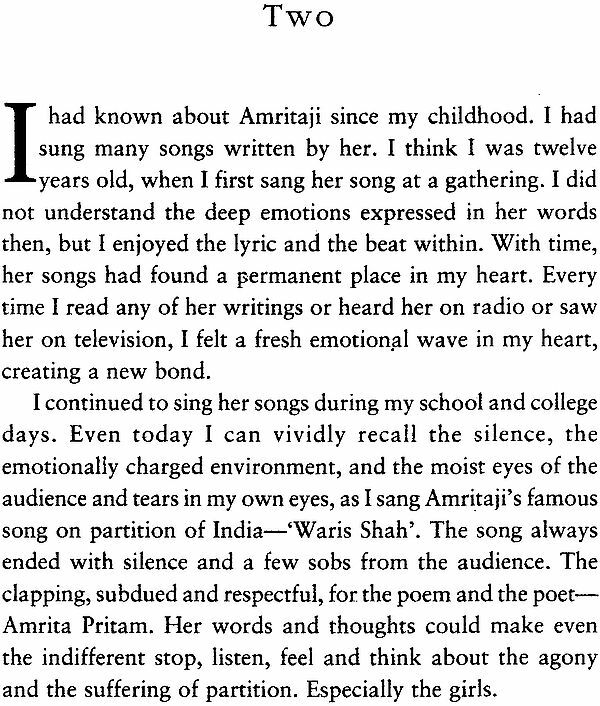 More than only for Amrita, this will become in history, a witness to Amrita and Imroz's relationship. 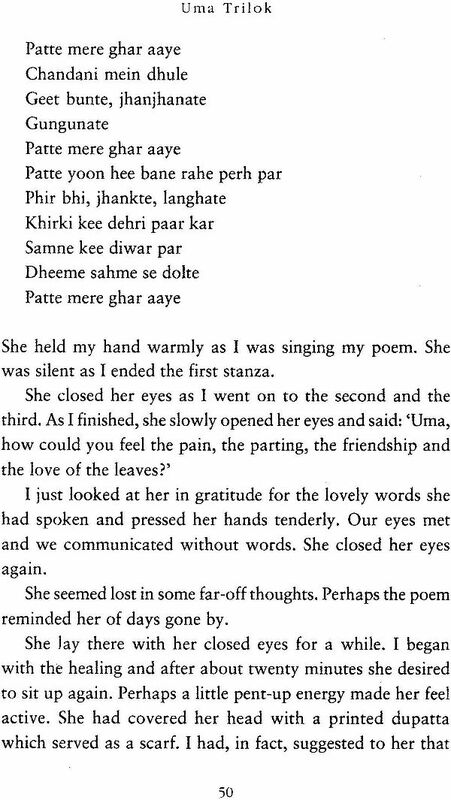 Acclaimed as the doyenne of Punjabi literature, Amrita Pritam received many awards, including India's highest literary award, the Jnanpith, in 1981. Born in Gujranwala, now in Pakistan, in 1919, she came to India after the partition of the subcontinent in 1947. her best-known work is a classic poem, addressed to the great eighteenth-century Sufi poet Waris Shah, in which she lament the carnage of Partition and calls on him to give voice from his grave. 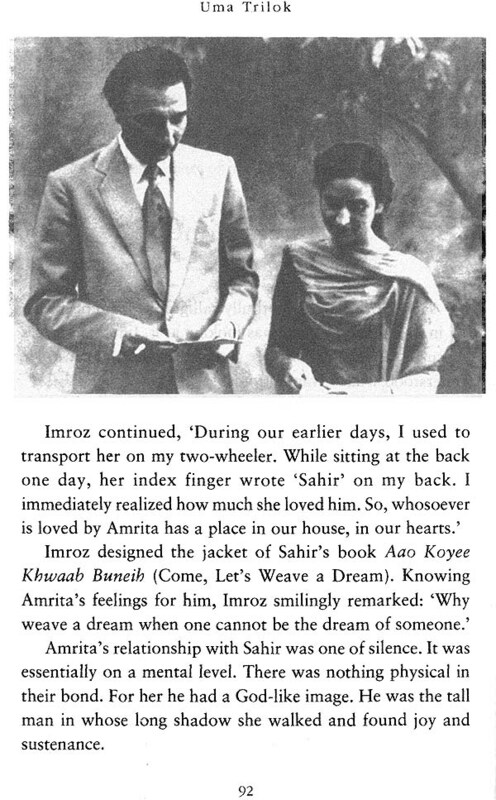 Amrita met Imroz, a well-known artist, in the 1960s and they became lifelong companions. They stayed together for more than forty years, till her death, after a long illness, in October 2005. 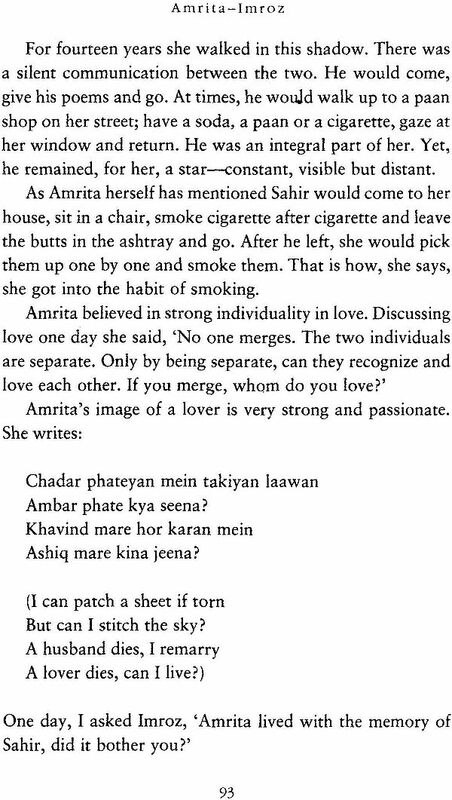 Amrita-Imroz: A Love Story offers living glimpses of the 'sacred hymn' of Amrita Pritam and Imroz's life together. Uma Trilok had the rare opportunity to witness their remarkable love story and the passionate bond that they shared for so many years. In this moving tribute she communicates her sense of deep wonder at their unique and unconventional relationship, as also her profound admiration for the creative energy of these two extraordinary individuals. Uma Trilok holds a doctorate degree in Educations Management and has been associated with several academic institutions. She writes both in English and Hindi and her published work includes Teesra Bindu, Of Autumn Roses, Khayalon ke Saaye and The Mindscape. She has also rendered a selection of her poetry, in her own voice, in an audio cassette.